Cartridge faucets generally use an up/down motion to regulate water flow and control temperature with a left/right motion. 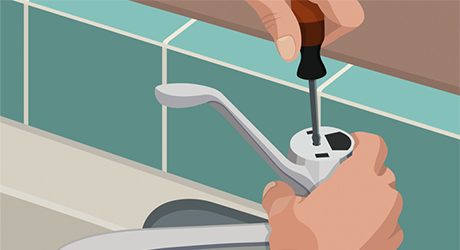 If you have a two-handle faucet with handles that turn 90 degrees, you have either a cartridge or compression faucet. Leaks in cartridge faucets are usually caused by worn-out cartridges or worn rubber O-ring seals. These problems are easily fixed using repair kits that include both replacement cartridges and O-rings. 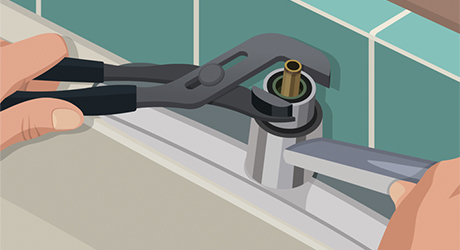 This guide will teach you to replace the cartridge in your sink using a few simple tools. 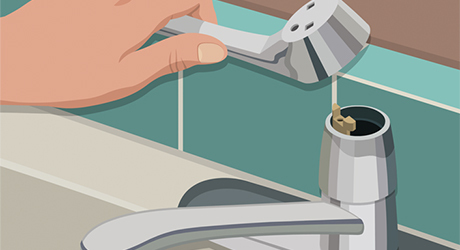 Note: This guide will help you fix cartridge faucets only. Compression faucets have two knobs or levers - one each for hot and cold. 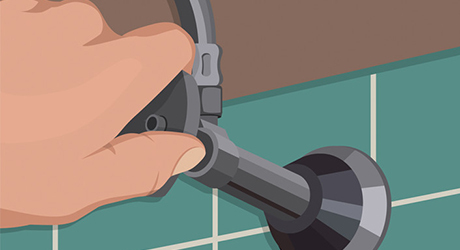 If you're fixing a compression faucet, use this guide. Ball-type faucets have a knob directly above the spout that controls water flow and temperature depending upon the direction it’s twisted. 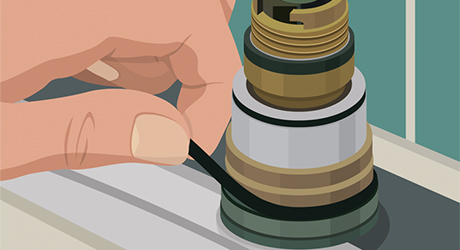 Read this guide for repair information for ball-type faucets. Turning off the water at the shut off valves under the sink. Fully open the faucet to both the hot and cold positions to allow any residual water to escape. Pry off the handle cap using a small flat screwdriver. Unscrew the screw on the handle and then lift the handle up to remove it from the assembly. Use water pump pliers to remove the plastic retaining nut. Lift the faucet spout straight up to remove it. Pull out any retaining clip using needle nose pliers. Remove the O-ring from the housing, using a screwdriver if necessary. Take this with you to the store to make identifying the replacement that much easier. 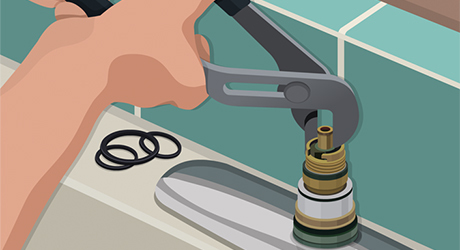 If you can’t slip the O-ring from its groove, cut it with a utility knife. Clean any debris from the faucet housing with a soft cloth. 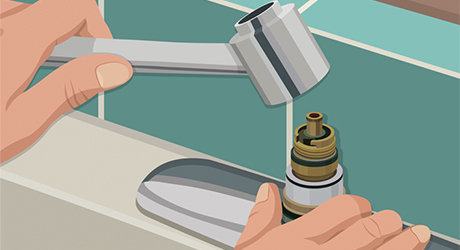 Cartridges come in many shapes and sizes, and the easiest way to find the right replacement part is to know the name of the faucet’s manufacturer and the faucet’s model number. If you’re not sure, take the old cartridge you’re replacing to the store so you can use a reference guide to match it to the exact cartridge you need. 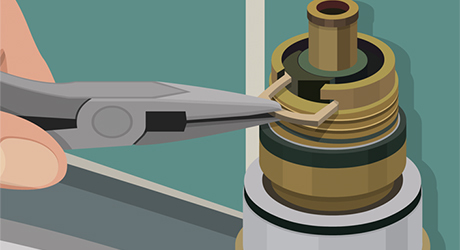 To replace the cartridge, grip the top of the cartridge with pliers and pull straight up to remove it. On some models of faucet you may have to remove the cartridge with a specialized tool, which will be indicated on manufacturer’s instructions. With the cartridge out, inspect O-rings for any damage. Replace all rings with the matching size. If the cartridge has any damage, install a new cartridge making sure it is aligned correctly. Coat the new O-ring with silicone grease and install on the faucet cylinder. Re-attach the spout and insert the retaining clip and screw on the plastic retaining nut. Place the handle on the assembly, secure it with the screw you removed earlier, and replace the handle cap. Place the handle in the on position and slowly turn the water back on at the valve.